the wild horse project: Fifty shades of nay! What started as turning wild horses into show horses is now much, much more. Adventures, travel, wildlife, horses and me. It's been fifty days since the wild horses were mustered. I wouldn't even realize it was day fifty except I saw someone else mention it on Facebook. How the hell has fifty days gone by so fast? Yet it seems a century ago that the horses were stepping off the truck. I can't believe how much they have changed in such a short time. They are barely recognizable as the same horses. From timid,shy and bedraggled, to absolutely confident in there new life. First of all the fact that some of them are already off succeeding in their new lives. I get updates from the owners all the time, and the wild boys are doing great. Both owners already want wild horses from the next muster! My boy Miro, is waiting for me every morning at his gate, loves coming into his stable, and watches and greets from his stable every time in near. I can't complain to much about the mud, when I'm lucky enough to be greeted by this face every day! Miro gets first ride today. Ok another Kaimanawa cam update! If you wanted to get really technical, New Zealand only has feral horses, not wild. As all the horses runing free, are descended from domestic stock, that has either escaped or been set loose, and found their way to the Kaimanawa ranges. That they now habitat in the centre of the north island. 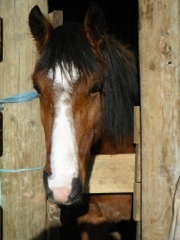 The first reports of horses runing free on the kaimanawa ranges, date back to 1876. Some of bloodlines known to have made into wild populations are Arabian, exmoor, Welsh, a group of Comet horses, stock horses from cattle or sheep stations as well as a Cavalry posts in the area. in 1981 the herds of horses runing free in the ranges, were put under protection by the New Zealand Government. numbers at that stage had plummeted to just 174 wild horses. But by 1994, numbers had risen to 1,576. With this many horses they were causing massive damage to their fragile and unique enviroment. The New Zealand Department of Conservation has been carrying out annual musters and culls, since 1993. unfortunatly horses that cannot be adopted out to private homes are slaughtered. The aim is to keep the wild population at a managable number for the health of the horses and the enviroment. The United Nations' Food and Agricultural Organization lists the Kaimanawa horses as a herd of special genetic value that can be compared with other groups of feral horses such as New Forest ponies, Assateague ponies, wild Mustangs, and with free-living zebras. Kaimanawas are of special value because of their low rate of interaction with humans. This lack of interaction may result in a herd with more wild and fewer domestic characteristics, which is of special interest to researchers.